It has been forever since I last baked/blogged and I am feeling very guilty for neglecting JessieCakes… however, I’ve finally got the baking bug back and have come up with a beauty of a recipe! Who’s heard of a Blondie and more importantly who’s tasted a Blondie!?!? And…why has it taken me this long to bake this amazing invention!? 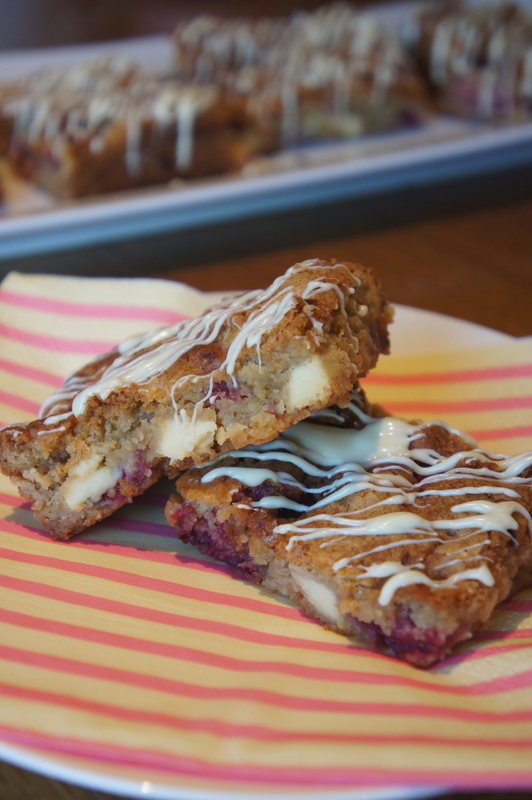 The texture of a Blondie is like combining melted chewy cookie dough with the fudgy gooeyness of a brownie. Sounding good? Well let me explain how they taste… like deep, rich buttery caramel. 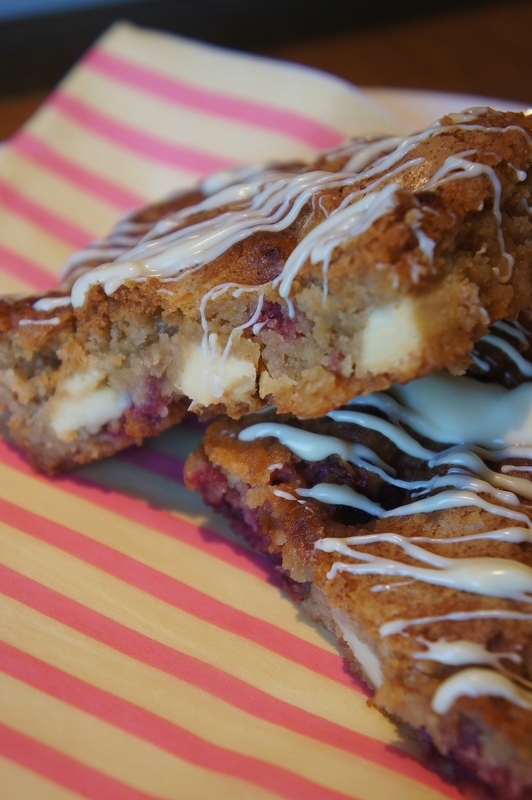 Throw is some white chocolate chunks and fresh raspberries and you just know you have created something special. Hopefully your taste buds are tingling and you are already reaching for your baking tins…I promise you that this recipe will not disappoint and trust me when I say that once you go Blondie you never go back! Preheat oven to 170°C and line a 23cm square baking tray with greaseproof paper. Sieve the sugar into a large bowl and pour in the melted butter, now use a wooden spoon to combine the ingredients. Crack in the eggs and add the vanilla extract and stir together. Now add the flour and fold the mixture together. 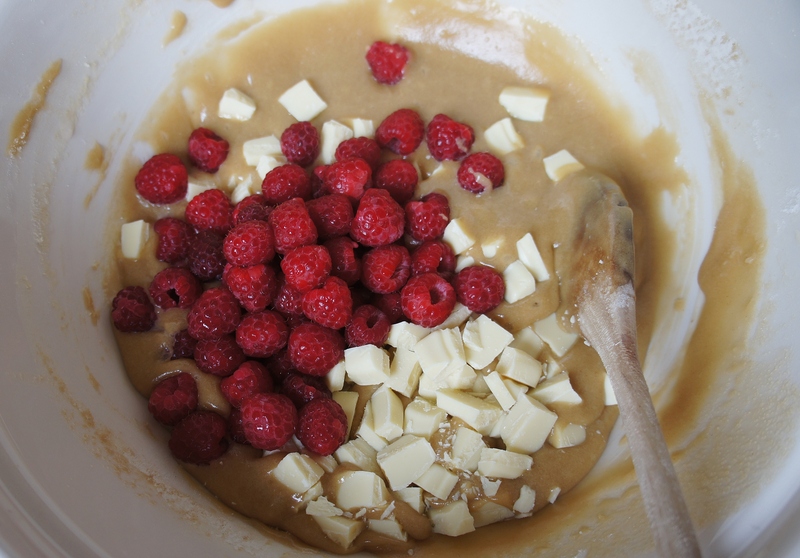 Add the white chocolate chunks and raspberries and fold into the mixture. Transfer the mixture to your prepared baking tray and smooth out the top. Bake in the oven for 23-25 minutes, until the top is starting to crack and is firm to the touch. Remove from the oven and leave to completely cool. Once the blondies have cooled, melt a few squares of white chocolate in the microwave and use a teaspoon to drizzle the chocolate over the tops of the blondies. Very carefully (blondies are very delicate and can fall apart easily) cut into 12 slabs and serve, warm or cold! Thanks bakinginfashion, I would definitely recommend giving these a go they taste like a brownie and a cookie all at the same time. I HAVE to try this! It sounds so good.